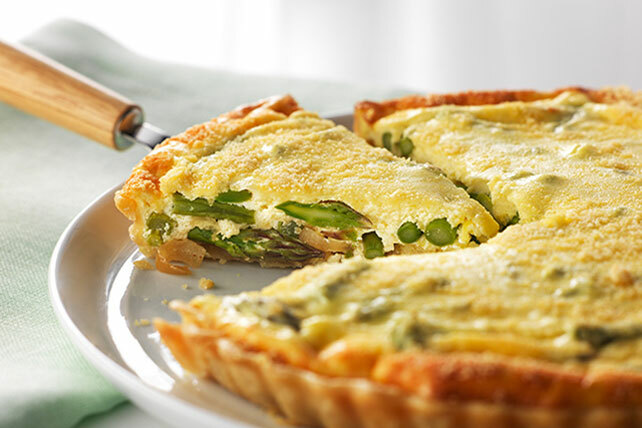 Try a tastier take on your average morning egg bake with our Asparagus-Parmesan Tart. Our creamy Asparagus-Parmesan Tart is great to serve at brunch. Line 9-1/2-inch tart pan with removable bottom with crust; trim edge. Prick bottom of crust with fork. Bake 10 to 12 min. or until lightly browned. Cool. Meanwhile, heat oil in nonstick skillet on medium heat. Add onions; cook 10 min. or until caramelized, stirring occasionally. Spread onions onto bottom of crust; top with asparagus. Whisk cream cheese, sour cream, eggs and lemon zest until blended. Stir in 1/4 cup Parmesan; pour over asparagus. Sprinkle with remaining Parmesan. Bake 20 to 24 min. or until filling is slightly puffed and set in center. Remove tart from side of pan before serving. Serve this flavorful tart with a crisp mixed green salad and fresh fruit to round out the meal. To blanch fresh asparagus, add the spears to a large pot of boiling water. Cook, uncovered, for 2 to 3 min. Drain, then immediately plunge the asparagus into a bowl of ice water to stop the cooking. When completely cool, drain and pat dry.